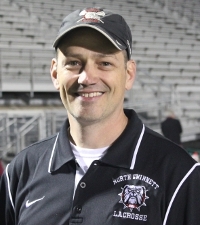 Coach Palocsik teaches Biology and Anatomy at North Gwinnett High School, and was named the head coach of the Bulldogs in the fall of 2014. In his first season, he led the program to the 2015 Class 6A Area 4 championship and it's first playoff victory, culminating in a state quarterfinal appearance. Coach Palocsik was selected by the Gwinnett Daily Post as the county Boys' Coach of the Year for 2015. This followed his selection as the county assistant coach of the year in 2014 during his first year with the program. He is a US Lacrosse Level 3 certified coach. John played lacrosse as a youth in New York and moved to Georgia with his family when he was 13. He stuck with soccer in high school and then played at the DII level in college at West Chester University of Pennsylvania. He has coached youth recreational and travel lacrosse for the last five years. Coach Palocsik plays goalie “old man lacrosse” in the adult league and his two sons Tyler and Chase both play youth lacrosse in the North Gwinnett Lacrosse Association. Coach Arthur Cho joined the Bulldogs' high school lacrosse program as the junior varsity head coach in 2015. In his first three seasons, he helped guide the JV squads to a combined 33-4-1 record. Coach Cho counts coaching-mentoring student athletes as his favorite pastime among his many hobbies. He takes pride in his personable and hands-on approach to teaching valuable lessons on the field, which he believes transfers over to the game of life off the field. Arthur has over 20 years of experience in coaching and training alongside youth, high school, college and pro athletes. He holds certifications with the Positive Coaching Alliance, US Lacrosse, International Sport Sciences Association and is GHSA community coach certified. He coached year-round in the NGLA from 2010-14, including summer travel programs, and MAYLA and Newtown select lacrosse leagues. Arthur also coached in the GFL from 2007-2013 and is currently an assistant coach with the NGHS football program. Coach Cho competed in hockey, football and wrestling in Canada throughout high school and college and graduated in 1994 from the University of Regina, Saskatchewan. He remains an avid strength and fitness enthusiast. Arthur works as a consultant for GCPS. He is proud to call North Gwinnett home with his wife, Thippy. Their daughter Maddy is a current freshman at UGA, and their son Turner, a senior at NGHS, plays lacrosse and football and is currently committed to Reinhardt University for lacrosse.